Whimsy has a home! 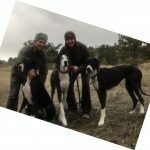 - Rocky Mountain Great Dane Rescue, Inc.
Whimsy has a home with Courtney in Livermore, CO. Courtney and her partner Zach have been patiently waiting for RMGDRI to help find that perfect match for their family. The time came when they saw Whimsy on our website and were able to proceed with the adoption of this lovely girl. Courtney and Zach are not strangers to the breed. Whimsy will be welcomed home by 2 female Danes (Sully & Cricket). Hikes around the hills is something that is a daily routine for this family….Way to go Whimsy!!!! !